Gender Task Force Launch event, The national Gallery. Iain White / Fennell Photography. Mary Mitchell O’Connor, Minister of State with special responsibility for Higher Education today (12th Nov 2018) announced the Senior Academic Leadership Initiative for the Higher Education sector at the launch of the Action Plan for Gender Equality in Higher Education Institutions 2018 – 2020. Under the Initiative new and additional female-specific senior academic positions will be created in the Higher Education sector. This ground-breaking positive action measure directly responds to the significant underrepresentation of women at professorial level and has a central role to play in evidencing the depth and breadth of female excellence in the Higher Education sector. In 2017 while in the university sector some 51% of Lecturers were female, only 24% of professors were female. In the Institute of Technology sector, some 45% of lecturers are female, but only 36% Senior Lecturer positions were held by females. Analysis reported in the Action Plan is that on the basis of current trends it could take 20 years to achieve the goal of a minimum of 40% female representation at professor level in the university sector. “This outcome would be untenable. Excellent women in our Higher Education sector are not filling sufficient senior academic roles, not because they are not talented, able and expert or committed enough. Rather the Taskforce has found that women face a number of serious barriers to progression that are not experienced to the same degree by their male colleagues. “In addition, to supporting the acceleration of the achievement of gender equality objectives under the Action Plan, this initiative will bring female excellence to the fore. 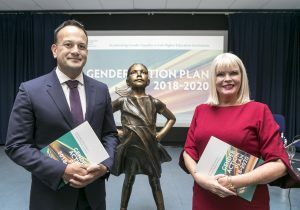 I know it will underpin the transformation and cultural change essential in ensuring that Ireland’s higher education sector fully realises the benefits of gender diversity.